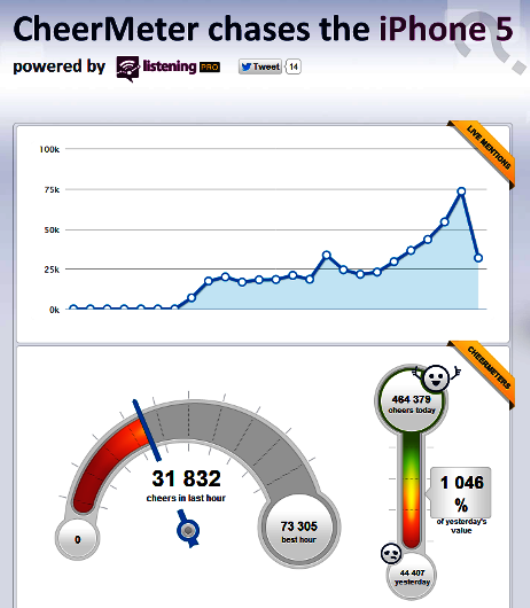 In the run up to the iPhone 5 release later this month, we’ve decided to ride the wave and follow the Twitter buzz again with our CheerMeter. We’re monitoring the volume of tweets and level of excitement that surrounds this latest release from Apple. CheerMeter will track and record the number of tweets per hour, per day and cover the entire period leading up to and following the launch to illustrate the Twitter trend. We also provide a live feed of the latest tweets and pics from Instagram, so you can check out for yourself what people are saying and seeing. And dont forget to save the date for the Engage 2012 event taking place October 23rd in New York City! Find out more here.